Since inception, Magento has countered a great popularity for exhibiting some of the most needful and unique features of web development. The exemplary set of features like scalability, usability, responsiveness, and intuitive functionality that it possess are in high demand among the developers as well as the users nowadays. Magento is a widely-known E-commerce development platform that comprehends various unmatched features to build exemplary business solutions. Evidently websites built on Magento are highly advanced, user-friendly, and flexible. Knowing the fact that it requires competent skills and expertise to remarkable benefits from Magento, site owners are diligently shifting to opt for Magento service providers. Contributing to the same, a number of Magento development companies have proliferated to cater such an increasing demand. Though the list of such companies is an advantage to newbie as well as established businesses but sometimes it can be confusing too. 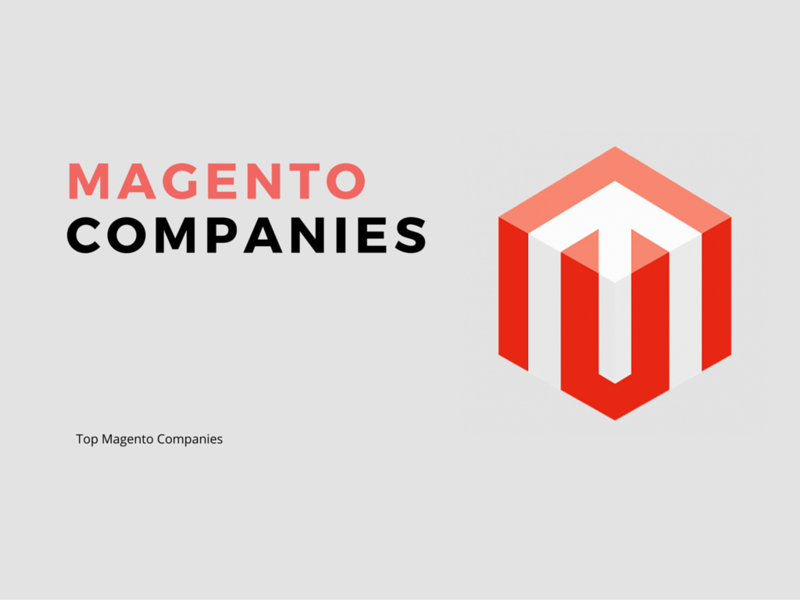 We have compiled a list of top 10 Magento development companies that have proven their metal in this realm. Choose the best that suits your business requisites. Sparx IT Solutions holds a leading name in the realm of Magento web development serving 90+ companies since inception. It holds a lead of competent developers who dedicatedly work for this firm to cater diversified clients for their business needs. Their competent services include Magento web development, optimization, migration, mobile app development, cloud hosting and much more. This company has gained huge popularity for being the reliable and most popular Magento service provider which is fondly exhibited from its increasing clientele. When it comes to developing remarkable web solutions, CSSChopper has proven its metal amongst the clients that it is the best mainstay for Magento web design and development. Each of their web solutions is specifically developed and proffered in accordance with the needs and demands of clients and their businesses. Each of their developers is professional, knowledgeable and dedicated, who strive to deliver tailored and sustainable web development solutions. From digital marketing to website development and content creation, the company is endeavoring to deliver growth-specific Magento solutions. Incepted in 2013, the company focuses on delivering competent Magento-powered solutions worldwide. The effectual strategies rendered by this company are the main reason leading to the popularity of this company amongst its competitors. The company is backed by a team of proficient developers who are willing to provide 24*7 exclusive Magento web development services. SEO optimization, leveraging user experience, social media app development, etc. are some the highlighted services they offer. HireWebDeveloper is a certified Magento web development company established in 2015, proffering exemplary web development services. The company comprehends an impressive portfolio built with the satisfaction of global clients. The competent, pocket-friendly and growth-oriented strategies adopted by the ardent developers of this company are matchless. PHPDevelopmentServices holds a prominent place in the list of leading Magento service providers for delivering sustainable and growth-specific web solutions. Using all the latest technologies and tools, the competent developers of this company have proven their metal in this realm. Serving over 9400+ happy clients worldwide, this company boasts a huge clientele having all leading brands. Pillared by a team of 40 professional developers, the company stands high on rendering creative web solutions. The company strives to deliver highly efficient and usable Magento shopping stores comprehending advanced functionalities. The dedicated staff of this company strives to deliver optimized Magento stores capable of providing relevant ROI. Crystal Infoway is an India based web development company that has delivered 1200+ projects successfully so far. This novice Magento service provider employs a dedicated team of developers who diligently work to proffer exemplary Magento powered web applications and sites. The competent technologies used by this company are matchless and unique. Fowara is an Atlanta based E-commerce development company that specializes in developing exquisite Magento based sites and applications. The dedicated staff of this company focuses on catering scalable shopping experience through their matchless web solutions and web development services. The company very well understands the need of generating ROI, facilitating customers and driving sales for the business growth. eBizTrait is a globally known web development agency pillared by the skills and competency of odd 30 talented staff members. The company believes in materializing its objective of delivering exclusive yet sustainable E-commerce web solutions to its customers. M-Connect Media is a US based web designing firm that utilizes the advanced and growth-oriented technologies to build remarkable Magento powered sites and applications. The company has successfully delivered 1200 projects so far, thus positioning itself in the list of most-sought-after Magento web service providers. We hope this list might help you in choosing the right web development company for your E-business. Feel free to add your feedback and reviews in the comment section below. With great years of experience as a writer,Tom Hardy works continually to share his ideas and posts on Webgranth. He keeps on researching various topics and sharing the information through engaging posts. Follow him on Google+, Facebook, and Twitter .